Yesterday was my mom’s birthday. She is the most wonderful woman I know, has a beautiful heart, and is my guidepost for everything. My mom has given me so much, my sense of adventure, my love for simple and beautiful food, and my wild mane of curls. Beyond that, she's filled my head and heart with tips and life lessons every step of the way. These are just a few of the many that I carry close to me. I could go on and on. But anywho, let's talk about all of this deliciousness! This is a simple and sweet summertime treat inspired by my mama. It plays on seasonal fruits and always turns out perfectly imperfect. We just love fresh berries, and I can’t wait to pick buckets and buckets together in the fields of upstate NY in a short week! I love you to the moon and back Mom, happiest of birthdays! blueberries, fresh picked if you can! Combine flour, cornmeal, flaxmeal, sugar, baking powder, and salt in a medium bowl. Cut the chilled butter into the dry mixture with two butter knives or a pastry cutter. Slowly add in the heavy cream, forming a flaky ball of dough. *Warning- don't add too much heavy cream, you want the dough to be somewhat flaky and not too sticky. Place your dough on a piece of parchment paper and flatten until it's about 1/2 inch thick. Beat the egg and a splash of heavy cream together and brush on top of the dough. Sprinkle generously with raw sugar and pop it in the oven for about 20 minutes, until golden brown. While the shortcake is cooking, pour 1 cup of heavy cream and vanilla extract into a chilled medium bowl. Whip the cream into soft peaks and set aside. Once the shortcake is done, let it cool for 10 minutes. 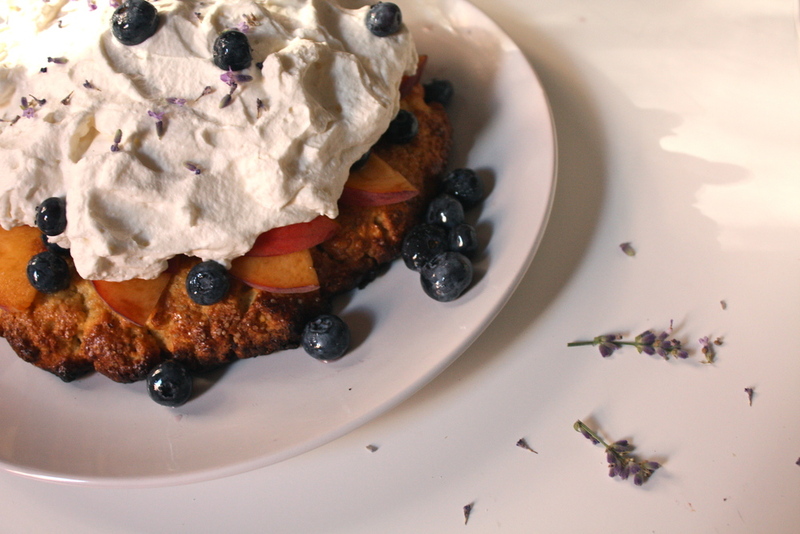 Arrange the peach slices and a couple handfuls of blueberries on top, follow with a few generous dollops of whipped cream, and finish with a sprinkling of blueberries and lavender blossoms.